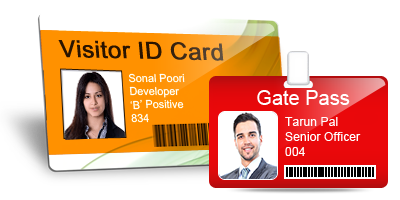 Visitors Gate Pass ID Cards Maker Software provides various pre-defined templates (pre-loaded Visitors ID Card Design) for quickly designing Gate Pass for visitors. Software creates visitor id cards with feature to maintain entire visitors records. If you do not find a template according to your choice, you can make further changes in ID card and build your own design using various card designing objects including line, text, rectangle, triangle, star, ellipse, barcode, signature, watermark, symbols, image library, browse image and card background. You can easily export (save) all visitors records in excel file format. Software has various image designing objects such as Line, Image Library, Card Background, Signature, Watermark, Barcode, Ellipse, Rectangle, Text, Browse Image, Symbols, Triangle and Star objects for creating ID card. 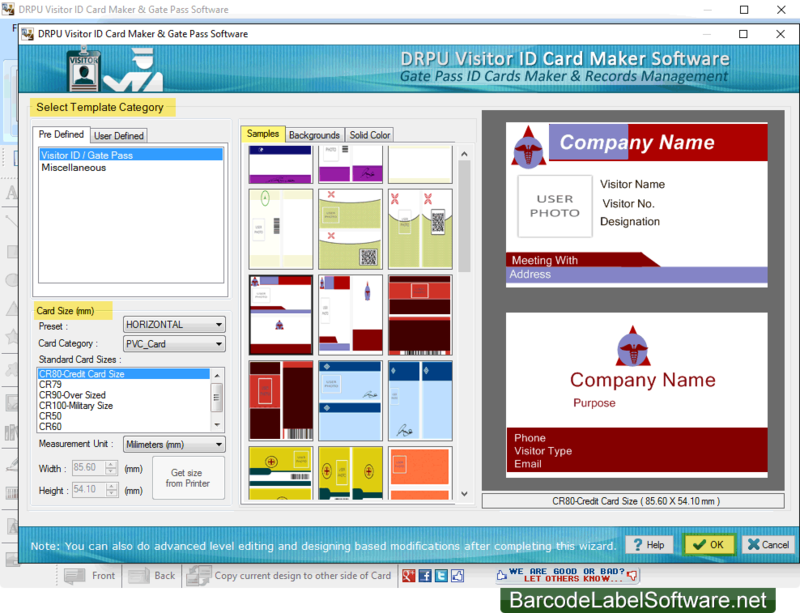 To quickly design Visitor Pass, software provides different types of pre-defined Visitors ID Card Design (pre-loaded templates). Add photo on visitor ID card by capturing image using camera settings or by browsing path of visitor image. You can crop image according to your ID card using Image Cropping tool available in software. You can save designed visitor ID card log (in .idd file format) for future usage. Software provides feature to export (save) designed id card as template, as PDF file format and as image (in JPEG, PNG and other File formats). You can generate Gate Pass ID card in different shapes such as Rectangle, Rounded Rectangle, and Ellipse. You can adjust color and background settings of Visitor Pass using Color, Gradient, Image and Style settings. Provides flexible print settings to print created ID cards for visitors. Send designed visitors ID cards to single or multiple email address using advanced Email-Settings. Program provides facility to create and print single side (Front) and two sides (Front and Back) of visitor id cards. You can also copy current card design to the other side of the card.